Stamp a Sweet Impression: Lots of Candy! I'm having so much fun reading all the comments on the SASI Sweet Treats post below - it's great to know there are people out there reading and loving this SASI blog! :) There's still time to enter to win the goodies. Just scroll down a couple of posts for the details and leave us a comment. While all of us at TE/SASI are gearing up for Christmas and the new release coming up this week, I wanted to share at least one more Halloween project that I've been working on for awhile. What's the first thing you think of when you think of Halloween? Ghosts? Haunted Houses? Jack-o-lanterns? Heck no! The first thing we all think of is CANDY!!! 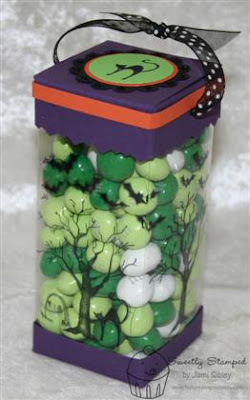 ;) I wanted to come up with several different fun candy presentations that you might be able to use for party favors or classroom treats or even little treats for your co-workers. 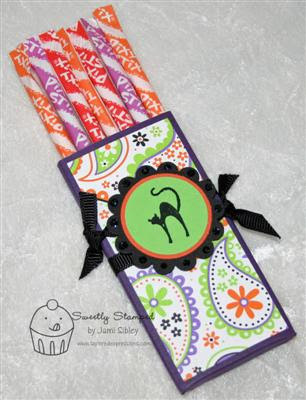 I've created four different coordinated candy treats along with a mini card (2.75" x 4"). I started out with the cat image from Frightful Night. I stamped and embossed him several times using black craft ink and clear ep on Green Galore cardstock. Then I punched the images out with a 1 1/4" circle punch. 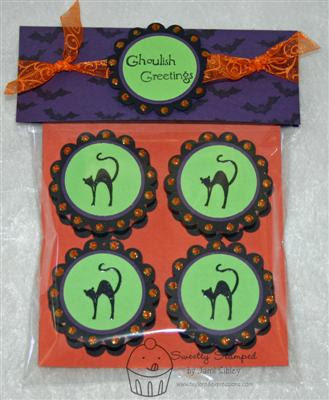 The cat images were layered onto either Pumpkin Pie or Elegant Eggplant 1 3/8" circles and then onto Black scallop circles. Stickles were added to all the scallop circles (either orange or black diamond). Unfortunately the stickles don't show up in some of the photos, bet they sure do IRL! Everything was made with the four colors (Black, Green Galore, Elegant Eggplant, Pumpkin Pie) of cardstock along with dp and ribbon from the TE Halloween Key Ingredients Kit. I just love that fun paisley patterned paper. Here are some close-ups of the different candy treats. First the peppermint patty package. Four York peppermint patties were decorated with the scallop circles and then attached to a 4" x 4.5" Pumpkin Pie cardstock panel. That was then slipped into a clear envie and a simple topper (using the bat image stamped in black) was attached. These are one of my favorite treats to make and they work for any season or holiday. Hmmm...maybe they're my fave because I love peppermint patties? 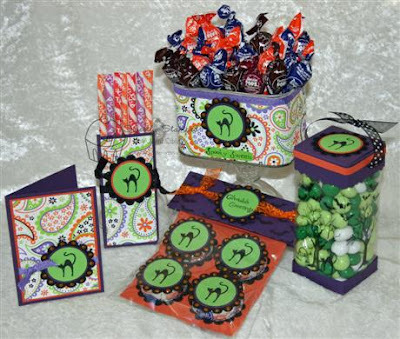 The idea for this acetate treat box came from the Technique Lover's Challenge on SCS hosted by Lynn Mercurio. You can see the box tutorial in that thread by clicking here. I started by scoring my acetate and then carefully stamping images from Frightful Night in Jet Black Stazon Ink. You have to be patient to let the ink completely dry before continuing on with the construction of the box. I had a partial bag of special edition Indiana Jones mint M&M's left over from before I started my diet and I loved the way the greens complimented my project. Of course now there are cool Halloween M&M's available too. Next comes my Pixie Stick treat. I just had to have Pixie Sticks for this project - such fond childhood memories. Ahhhh...the pure sugary goodness! When I was trying to decide how many PS I wanted to put into my treat holder I checked the serving size on the back of the bag. Turns out 7 Pixie Sticks constitute *a serving* (who knew?) and it's only 60 calories! If I ate 7 Pixie Sticks now I think I'd fall into a sugar coma, but maybe that's seems more reasonable when you're a kid! LOL! To make this treat holder I just played around with some measurements and scoring and ended up with an Eggplant panel 5" x 4.5". It's scored at 1.25" and 1.5" and again at 3.5" and 3.75". Then it's scored at .5" up from the bottom and snipped to be able to fold into a little box of sorts. Super simple. I have a whole bag of Pixie Sticks so I guess I better get busy making some more of these of the treat boxes! 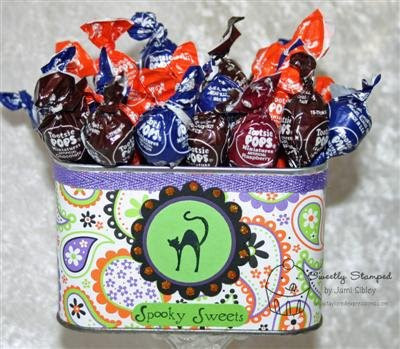 The last treat container is a tin for Mini Tootsie Pops. The tin is just one of the international coffee tins covered in the paisley dp. I think this would be great to have on your desk at work as a fun way to share a little something sweet with your co-workers. I hope you've gotten some ideas you can use for last minute Halloween treats or maybe you can start early and adapt these into Christmas treats. You know we're all about the sweets around here! Be sure to tune in tomorrow for Taylor Tuesday - you just might get a little peek of things to come! Jami can I come to your house?!?! Oh yeah, I'm with Otter...I want to come over too. ....and I LOVE pixie sticks...totally forgot about them, but man do I love them! Well someone's been busy! LOL! I love all your projects, but I must say the acetate box is my favorite. You did a wonderful job on everything! Thanks for the great ideas! They rock, and so do you! omgoodness - I LOVE these!! I do think I've found an easy thing for my daughter's classes in the peppermint patties one. Thanks so much for sharing!! Very cute! Love the colors in that paisley dp. Never would've thought of Green Galore as a Halloween color. So sorry I didn't respond sooner - I had somehow missed this question. I used sticky strip to adhere the paper to the tin. I'm sorry but I gave the tin away so I don't have it to measure. There's no template - I just measured and cut the dp and wrapped it around - it overlaps on the sides.